For other uses, see Apulia (disambiguation) and Puglia (disambiguation). Apulia (/əˈpuːliə/ ə-POO-lee-ə; Italian: Puglia [ˈpuʎːa]; Neapolitan: Pùglia [ˈpuʝːə];[a] Albanian: Pulia; Ancient Greek: Ἀπουλία, translit. Apoulía) is a region in Southern Italy bordering the Adriatic Sea to the east, the Ionian Sea to the southeast, and the Strait of Otranto and Gulf of Taranto to the south. The region comprises 19,345 square kilometers (7,469 sq mi), and its population is about four million. Apulia's coastline is longer than that of any other mainland Italian region. In the north, the Gargano promontory extends out into the Adriatic like a 'sperone' ("spur"), while in the south, the Salento peninsula forms the 'tacco' ("heel") of Italy's boot. The highest peak in the region is Mount Cornacchia (1,152 meters above sea level) within the Daunian Mountains, in the north along the Apennines. Outside of national parks in the North and West, most of Apulia and particularly Salento is geographically flat with only moderate hills. The climate is typically mediterranean with hot, dry and sunny summers and mild, rainy winters. Snowfall, especially on the coast is rare but has occurred as recently as January 2019 (following on from snow in March 2018 and January 2017). Apulia is among the hottest and driest regions of Italy in summer with temperatures sometimes reaching up to and above 40 °C in Lecce and Foggia. The coastal areas, particularly on the Adriatic and in the southern Salento region are frequently exposed to winds of varying strengths and directions, strongly affecting local temperatures and conditions, sometimes within the same day. The Northerly Bora wind from the Adriatic can lower temperatures, humidity and moderate summer heat while the Southerly Sirocco wind from North Africa can raise temperatures, humidity and occasionally drop red dust from the Sahara. On some days in spring and autumn, it can be warm enough to swim in Gallipoli and Porto Cesareo on the Ionian coast while at the same time, cool winds warrant jackets and sweaters in Monopoli and Otranto on the Adriatic coast. After 1282, when the island of Sicily was lost, Apulia was part of the Kingdom of Naples (confusingly known also as the Kingdom of Sicily), and remained so until the unification of Italy in the 1860s. This kingdom was independent under the House of Anjou from 1282 to 1442, then was part of Aragon until 1458, after which it was again independent under a cadet branch of the House of Trastámara until 1501. As a result of the French–Spanish war of 1501–1504, Naples again came under the rule of Aragon and the Spanish Empire from 1504 to 1714. When Barbary pirates of North Africa sacked Vieste in 1554, they took an estimated 7,000 slaves. The coast of Apulia was occupied at times by the Turks and at other times by the Venetians. The share of gross value added by the agricultural and services sectors was above the national average in 2000. The region has industries specialising in particular areas, including food processing and vehicles in Foggia; footwear and textiles in the Barletta area, and wood and furniture in the Murge area to the west. Apulia's thriving economy is articulated into numerous sectors boasting several leading companies: Aerospace (Sitael, Blackshape, Leonardo S.p.A.); Agriculture (Casillo Group, G.C. Partecipazioni), Automotive (Getrag, a subsidiary of Magna International); Food and Beverage (De Carlo, Divella, Quarta Caffé); Furniture (Natuzzi); ICT (Exprivia); Mechanics (Isotta Fraschini Motori, MERMEC); Publishing (Laterza), Tourism (Nicolaus tour). The unemployment rate stood at 18.8% in 2017 and was higher than the national average. There is an estimated 50 to 60 million olive trees in Puglia and the region accounts for 40% of Italy's olive oil production. There are four specific Protected Designation of Origin (PDO) covering the whole region. Olive varieties include: Baresane, Biancolilla, Brandofino (Castiglione), Buscionetto (Biancolilla), Carolea, Cellina di Nardò, Cerasuola (Ogliara), Cerignola (Bella di Cerignola), Cima di Bitonto, Cima di Mola, Coratina, also grown in Corning, CA., a 2018 Gold Medal New York International Olive Oil Competition (NYIOOC) winner, Frantoio, Garganica, La Minuta, Leccino, Moresca, Nocellara Etnea, Nocellara Messinese, Ogliarola, Ogliarola Barese, Ogliara Messinese, Ottobratica, Peranzana that is produced as "Certified Ultra-Premium Extra Virgin Olive Oil", Rotondella, Santagatese, Saracena, Tonda Iblea, and Verdello (subspecies of San Benedetto). There has been an issue of marketed "extra pure" olive oil actually being imported from Spain, the Balkans, Turkey, and Tunisia. This includes the use of rectified lampante, being allowed due to a controversial 1995 law. The olive oil industry in Puglia is under threat from the pathogen Xylella fastidiosa, a disease which inhibits the uptake of water and nutrients by the trees. 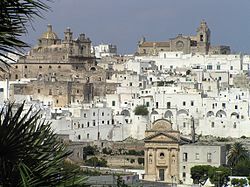 The south-eastern part of Puglia is at the centre of the epidemic. The region has a good network of roads, but the railway network is less comprehensive, particularly in the south. The region is crossed northwest to southeast by the A14 highway (Bologna–Taranto), which connects the region capital, Bari, to Taranto, the second most populous city in the region. The A14 also connects Foggia and points further north along the Adriatic coast to Pescara, Ancona, Rimini and eventually, Bologna. The only other highway in the region is the A16 (Napoli–Canosa), which crosses the Italian peninsula east–west and links the region with Napoli. There are two international airports, Karol Wojtyla Airport in Bari (IATA: BRI) and Brindisi Airport (IATA: BDS), which serves as the principal logistical hub for the United Nations Global Service Center headquartered in Brindisi. With the approval of a redevelopment project in 2018, the Grottaglie Airfield (IATA: TAR) will host a spaceport for the Italian Space Agency and Virgin Galactic. Emigration from the region's depressed areas to northern Italy and the rest of Europe was very intense in the years between 1956 and 1971. Subsequently, the trend declined as economic conditions improved, to the point where there was net immigration in the years between 1982 and 1985. Since 1986 the stagnation in employment has led to a new inversion of the trend, caused by a decrease in immigration. Cuisine plays an important role throughout Apulia. The key locally produced ingredients used there include olive oil, artichokes, tomatoes, aubergine, asparagus, and mushrooms. In summer it is very common to use also the carosello, a variety of muskmelon which is often consumed in an immature state. Several PDO and PGI products are made in Apulia; among can be found some types of cheese like the Canestrato Pugliese PDO and Burrata di Andria PGI, of olive oil like the Collina di Brindisi PDO, Dauno PDO, Terra d'Otranto PDO, Terre Tarentine PDO and Terra di Bari PDO, some fruits and vegetables like the Arancia del Gargano PGI, Carciofo Brindisino PGI, Cipolla bianca di Margherita PGI, Clementine del Golfo di Taranto PGI, La Bella della Daunia PDO, Limone femminello del Gargano PGI, Patata novella di Galatina PGI and Uva di Puglia PGI. Moreover, also a type of bread, Pane di Altamura PDO and a legume called Lenticchia di Altamura PGI are present in the list. As with the other regions of Italy, the national language (since 1861) is Italian. However, because of its long and varied history, other historical languages have been used in this region for centuries. In isolated pockets of the southern part of Salento, a dialect of Greek called Griko is still spoken by a few thousand people. In addition, rare dialects of the Franco-Provençal language called Faetar and the closely related Cellese are spoken by a dwindling number of individuals in the mountain villages of Faeto and Celle di San Vito, in the Province of Foggia. The Arbëreshë dialect of the Albanian language has been spoken by a small community since refugees settled there in the 15th century. ^ "Regional gross domestic product by NUTS 2 regions - million". Eurostat. Retrieved 8 September 2013. ^ "Introducing Puglia". Lonely Planet. Retrieved 8 July 2017. ^ "Holiday guide to Puglia, southern Italy: the best towns, restaurants and hotels". The Guardian. Guardian Media Group. 4 July 2015. Retrieved 15 November 2016. 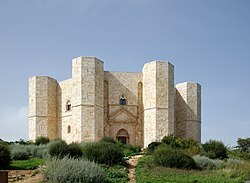 ^ "Italy: Puglia". Rough Guides. Retrieved 8 December 2013. ^ Asaolu, Richard Oluseyi (n.d.). Slavery:Abolition. Mainz: Pedia. p. 50. Retrieved 3 June 2017. ^ "Eurostat". Greenreport. Archived from the original on April 24, 2014. Retrieved 2010-08-02. ^ a b "Puglia - Economy". Portrait of the Regions. Eurostat. March 2004. Archived from the original on August 21, 2009. Retrieved 8 July 2017. ^ Amílcar Soares, Maria João Pereira, Roussos Dimitrakopoulos! geoENV VI – Geostatistics for Environmental Application (2008), p. 191: "The approach highlighted the widespread degradation of water resources in the Apulian groundwater. ... Above all the rapid socio-economic growth over the last decades has caused severe stress to the Apulian hydrogeological system." ^ "Eurostat". c.europa.eu. Archived from the original on July 21, 2011. Retrieved 2010-04-22. ^ "Scheda Personale". Sito web Istituzionale della Regione Puglia (in Italian). Retrieved October 17, 2015. ^ "BIOGRAFIA" (PDF). CompletaMente.org (in Italian). Retrieved September 5, 2015. ^ "Ethnologue report for language code:ell". Ethnologue.com. Archived from the original on 28 May 2010. Retrieved 2010-04-22. ^ Nagy, Naomi (2011). "A Multilingual Corpus to Explore Variation in Language Contact Situations" (PDF). Rassegna Italiana di Linguistica Applicata. 43 (1–2): 3. Retrieved 3 February 2017. ^ "Ethnologue report for language code:aae". Ethnologue.com. Retrieved 13 July 2016. Roy Domenico (2002). "Apulia". Regions of Italy: a Reference Guide to History and Culture. Greenwood. ISBN 0313307334.